This is such an easy thing to do, I don’t understand why more people don’t take advantage of the opportunity. 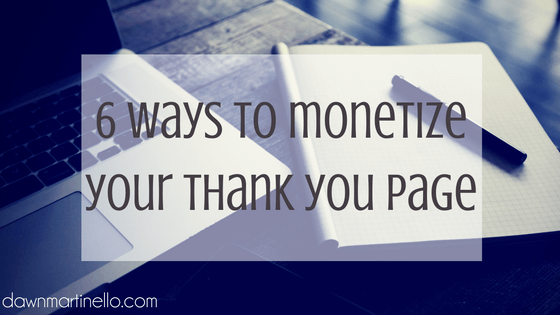 I hate leaving money on the table so optimizing my thank you pages is an incredibly important step no matter what I’m offering my readers. There’s 3 things that should happen on every single thank you page. Every. Single. One. Confirmation: you want to confirm whatever transaction just took place. Thank them for their purchase, thank them for taking the survey, thank them for subscribing. Measuring Conversions: whether it’s a Facebook ad or your Google Analytics, your thank you page can be used as a measure of a conversion. When I set up a lead ad in Facebook and optimize it for conversions, the way Facebook knows that it was successful is if that person reaches the thank you page. The same is true in Google Analytics. Makes Another Offer: I prefer to make another sales offer of some kind. If they subscribe to my newsletter, I’m offering what is called a trip wire. If they’re buying the trip wire, you want to offer your big core offer. But it doesn’t have to be a sales pitch. The offer could be to visit more of your best content or to create engagement on your Facebook page. 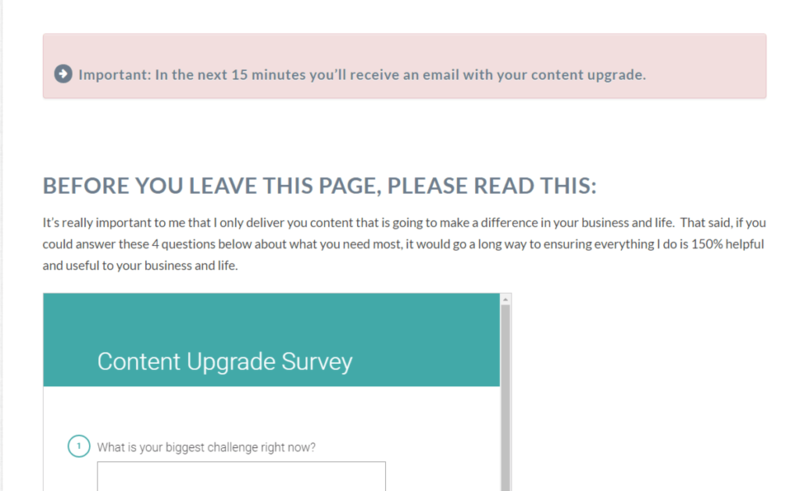 Another point to remember: never put a download link on your thank you page. There’s a chance that they may have given you a bum email address or there may have been a typo when they signed up. Always deliver your assets in email. Now just remember, if they landed on a thank you page, they’re in a grove and they already love you. Just show them which direction to go next. Grab this week’s Content Upgrade: Create Alluring Lead Magnets That Will Attract Your Perfect Client. It’s filled to the brim with free content including a worksheet and video that explains the 3 things that every lead magnet must have, the 3 problems people always run into when trying to create a newsletter opt in, ideas for free and paid promotion and a list of resources for you to get it done now. Create a list of your most popular posts. List out your resource pages or a few links to any guides or tutorials that they may be interested in. The more relevant to the content they just signed up for, the better. This helps to keep people on your site and engaged. It also helps to reinforce just how stinking great you are by providing them with more helpful information. Social Triggers does this well. I signed up for a free ebook and his thank you page let me know that it was on it’s way and asked me to leave a comment if I was happy about receiving the free book. He’s starting a happy little community right there on his thank you page via Facebook comments. You can also encourage them to visit your other social media accounts. Please, only list the ones that are incredibly relevant. If you only post pictures of your kids on Instagram, there’s no a huge point to driving a ton of traffic there. You can also pop some share buttons there with a little blurb asking them to share the content with their friends. Include a few testimonials too. If you’ve taken my Target Market Bootcamp, you know why this is so bloody important (especially when you do them right). People see themselves in the problems, they see where they want to be in the solution. Plus, it reinforces that you’re a pretty great person to work with or read if these other people are doing it too. Here’s where you could offer your trip wire or a special offer that’s only available for a limited time for new subscribers. If you can use a timer – do it! It helps keep people on track for making the decision as to whether or not they want to buy your offer. What are you struggling with most right now? If I could create one free product for you right now, what would it be? What’s your goal for the next month, 6 months, year? What’s your favourite book, magazine, blog, forum? If you could change anything about my product X, what would it be? Make sure you’ve grabbed this weeks Content Upgrade. You won’t want to miss it. Then leave me a comment below and tell me what your big goal with your thank you pages: brand recognition, sales, feedback or market research?